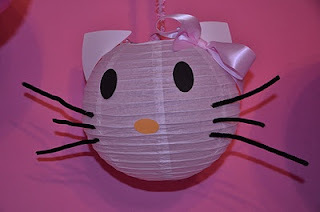 It's been hard trying to find inspiration on decorating for a Hello Kitty party out in blog land. Fortunatly, I finally found this Hello Kitty party from Pirates & Princesses. I love the AWESOME factor in this easy decoration. It's simply cardstock cut into shapes, ribbon tied into a bow, and pipe cleaners glued onto a dollar store lantern decoration. Simple, easy, and a definite WOW factor.